South Ossetia (green), Georgia, and Abkhazia (light grey). South Ossetia (/ɒˈsɛtjə/, less commonly /ɒˈsiːʃə/), officially the Republic of South Ossetia – the State of Alania, or the Tskhinvali Region, is a disputed territory in the South Caucasus, in the northern part of the internationally recognised Georgian territory. It has a population of 53,000 people who live in an area of 3,900 km2, south of the Russian Caucasus, with 30,000 living in Tskhinvali. The separatist polity, Republic of South Ossetia (or the State of Alania), is recognised as a state by Russia, Venezuela, Nicaragua, Nauru, and Syria. While Georgia lacks control over South Ossetia, the Georgian government and most members of the United Nations consider the territory part of Georgia, whose constitution designates the area as "the former autonomous district of South Ossetia", in reference to the former Soviet autonomous oblast disbanded in 1990. Georgia does not recognise the existence of South Ossetia as a political entity, and therefore its territory does not correspond to any Georgian administrative area (although Provisional Administrative Entity of South Ossetia was created by the Georgian authorities as a transitional measure leading to the settlement of South Ossetia's status), with most of the territory included into Shida Kartli region. The area is often informally referred to as the legally undefined Tskhinvali Region[nb 1] in Georgia and in international organisations when neutrality is deemed necessary. South Ossetia relies heavily on military, political and financial aid from Russia. South Ossetia, Transnistria, Artsakh, and Abkhazia are sometimes referred to as post-Soviet "frozen conflict" zones. Fragment of the historical map by J. H. Colton. The map depicts the Caucasus region in 1856. Modern South Ossetia is located in Georgia and Imeria. Modern North Ossetia approximately corresponds to "Ossia". The territory of contemporary South Ossetia was part of the kingdom of Iberia, the latter was unified under the single Georgian monarchy in 11th-century, extending its possessions up to Dvaleti. The Ossetians are believed to originate from the Alans, an Iranian tribe. In the 8th century a consolidated Alan kingdom, referred to in sources of the period as Alania, emerged in the northern Caucasus Mountains. Around 1239-1277 Alania fell before the Mongol and later to the Timur's armies, that massacred much of the Alanian population. The survivors among the Alans retreated into the mountains of the central Caucasus and gradually started migration to the south. In 1299, Gori was captured by the Alan tribesmen fleeing the Mongol conquest of their original homeland in the North Caucasus. The Georgian king George V recovered the town in 1320, pushing the Alans back over the Caucasus mountains. In the 17th century, by pressure of Kabardian princes, Ossetians started a second wave of migration from the North Caucasus to Georgia. Ossetian peasants, who were migrating to the mountainous areas of the South Caucasus, often settled in the lands of Georgian feudal lords. The Georgian King of the Kingdom of Kartli permitted Ossetians to immigrate. According to Russian ambassador to Georgia Mikhail Tatishchev, at the beginning of the 17th century there was already a small group of Ossetians living near the headwaters of the Greater Liakhvi River. In the 1770s there were more Ossetians living in Kartli than ever before. This period has been documented in the travel diaries of Johann Anton Güldenstädt who visited Georgia in 1772. The Baltic German explorer called modern North Ossetia simply Ossetia, while he wrote that Kartli (the areas of modern-day South Ossetia) was populated by Georgians and the mountainous areas were populated by both Georgians and Ossetians. Güldenstädt also wrote that the northernmost border of Kartli is the Major Caucasus Ridge. By the end of 18th century, the ultimate sites of Ossetian settlement on the territory of modern South Ossetia were in Kudaro (Jejora river estuary), Greater Liakhvi gorge, the gorge of Little Liakhvi, Ksani River gorge, Guda (Tetri Aragvi estuary) and Truso (Terek estuary). The Georgian Kingdom of Kartli-Kakheti, part of which was the major territory of modern South Ossetia, was annexed by the Russian Empire in 1801. Ossetian migration to Georgian areas continued in the 19th and 20th centuries, when Georgia was part of the Russian Empire and Ossetian settlements in Trialeti, Borjomi, Bakuriani and Kakheti emerged as well. Following the Russian revolution, the area of modern South Ossetia became part of the Democratic Republic of Georgia. In 1918, conflict began between the landless Ossetian peasants living in Shida Kartli (Interior Georgia), who were influenced by Bolshevism and demanded ownership of the lands they worked, and the Menshevik government backed ethnic Georgian aristocrats, who were legal owners. Although the Ossetians were initially discontented with the economic policies of the central government, the tension soon transformed into ethnic conflict. The first Ossetian rebellion began in February 1918, when three Georgian princes were killed and their land was seized by the Ossetians. The central government of Tiflis retaliated by sending the National Guard to the area. However, the Georgian unit retreated after they had engaged the Ossetians. Ossetian rebels then proceeded to occupy the town of Tskhinvali and began attacking ethnic Georgian civilian population. During uprisings in 1919 and 1920, the Ossetians were covertly supported by Soviet Russia, but even so, were defeated. According to allegations made by Ossetian sources, the crushing of the 1920 uprising caused the death of 5,000 Ossetians, while ensuing hunger and epidemics were the causes of death of more than 13,000 people. The Soviet Georgian government, established after the Red Army invasion of Georgia in 1921, created an autonomous administrative unit for Transcaucasian Ossetians in April 1922 under pressure from Kavbiuro (the Caucasian Bureau of the Central Committee of the Russian Communist Party), called the South Ossetian Autonomous Oblast (AO). Some believe that the Bolsheviks granted this autonomy to the Ossetians in exchange for their help in fighting the Democratic Republic of Georgia and favoring local separatists, since this area had never been a separate entity prior to the Russian invasion. The drawing of administrative boundaries of the South Ossetian AO was quite a complicated process. Many Georgian villages were included within the South Ossetian AO despite numerous protests by the Georgian population. While the city of Tskhinvali did not have a majority Ossetian population, it was made the capital of the South Ossetian AO. In addition to parts of Gori Uyezd and Dusheti Uyezd of Tiflis Governorate, parts of Racha Uyezd of Kutaisi Governorate (western Georgia) were also included within the South Ossetian AO. All these territories historically had been indigenous Georgian lands. Historical Ossetia in the North Caucasus did not have its own political entity before 1924, when the North Ossetian Autonomous Oblast was created. 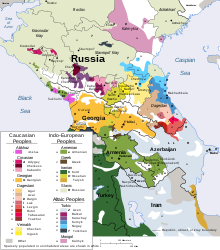 Although the Ossetians had their own language (Ossetian), Russian and Georgian were administrative/state languages. Under the rule of Georgia's government during Soviet times, Ossetians enjoyed minority cultural autonomy, including speaking the Ossetian language and teaching it in schools. In 1989, two-thirds of Ossetians in the Georgian Soviet Socialist Republic lived outside the South Ossetian AO. Tensions in the region began to rise amid rising nationalism among both Georgians and Ossetians in 1989. Before this, the two communities of the South Ossetian Autonomous Oblast of the Georgian SSR had been living in peace with each other except for the 1918–1920 events. Both ethnicities have had a high level of interaction and high rates of intermarriage. Dispute surrounding the presence of the Ossetian people in the South Caucasus has been one of the causes of conflict. Although Georgian historiography believes that Ossetian mass migration to the South Caucasus (Georgia) began in the 17th century, Ossetians claim to have been residing in the area since ancient times and that present-day South Ossetia is their historical homeland. No evidence exists to back up the Ossetian claims of being indigenous to South Ossetia. Some Ossetian historians accept that the migration of Ossetian ancestors to modern South Ossetia began after the Mongol invasions of the 13th century, while one South Ossetian de facto foreign minister in the 1990s admitted that the Ossetians first appeared in the area only in the early 17th century. Since it was created after the Russian invasion of 1921, South Ossetia was regarded as artificial creation by Georgians during the Soviet era. The South Ossetian Popular Front (Ademon Nykhas) was created in 1988. On 10 November 1989, the South Ossetian regional council asked the Georgian Supreme Council to upgrade the region to the status of an "autonomous republic". The decision to transform the South Ossetian AO into the South Ossetian ASSR by the South Ossetian authorities escalated the conflict. On 11 November, this decision was revoked by the Georgian parliament. The Georgian authorities removed the First Party Secretary of the oblast from his position. The Georgian Supreme Council adopted a law barring regional parties in summer 1990. Since this was interpreted by South Ossetians as a move against Ademon Nykhas, they declared full sovereignty as part of the Union of Soviet Socialist Republics (USSR) on 20 September 1990. Ossetians boycotted subsequent Georgian parliamentary elections and held their own contest in December. In October 1990, the parliamentary election in Georgia was won by Zviad Gamsakhurdia's "Round Table" block. On 11 December 1990, Zviad Gamsakhurdia's government declared the Ossetian election illegitimate and abolished South Ossetia's autonomous status altogether. Gamsakhurdia rationalized the abolition of Ossetian autonomy by saying, "They [Ossetians] have no right to a state here in Georgia. They are a national minority. Their homeland is North Ossetia.... Here they are newcomers." When the Georgian parliament declared a state of emergency in the territory of South Ossetian AO on 12 December 1990, troops from both Georgian and Russian interior ministries were sent to the region. After the Georgian National Guard was formed in early 1991, Georgian troops entered Tskhinvali on 5 January 1991. The 1991–92 South Ossetia War was characterised by general disregard for international humanitarian law by uncontrollable militias, with both sides reporting atrocities. The Soviet military facilitated a ceasefire as ordered by Mikhail Gorbachev in January 1991, later they were participating in the conflict on the Ossetian side. In March and April 1991, Soviet interior troops were reported actively disarming militias on both sides, and deterring the inter-ethnic violence. Zviad Gamsakhurdia asserted that the Soviet leadership was encouraging South Ossetian separatism in order to force Georgia not to leave the Soviet Union. Georgia declared its independence in April 1991. As a result of the war, about 100,000 ethnic Ossetians fled the territory and Georgia proper, most across the border into North Ossetia. A further 23,000 ethnic Georgians fled South Ossetia to other parts of Georgia. Many South Ossetians were resettled in uninhabited areas of North Ossetia from which the Ingush had been expelled by Stalin in 1944, leading to conflicts between Ossetians and Ingush over the right of residence in former Ingush territory. On 29 April 1991, the western part of South Ossetia was affected by an earthquake, which killed 200 and left 300 families homeless. On 24 June 1992, Shevardnadze and the South Ossetian government signed the Sochi ceasefire agreement, brokered by Russia. The agreement included obligations to avoid the use of force, and Georgia pledged not to impose sanctions against South Ossetia. The Georgian government retained control over substantial portions of South Ossetia, including the town of Akhalgori. A Joined Peacekeeping force of Ossetians, Russians and Georgians was established. On 6 November 1992, the Organization for Security and Cooperation in Europe (OSCE) set up a mission in Georgia to monitor the peacekeeping operation. From then until mid-2004 South Ossetia was generally peaceful. Following the 2003 Rose Revolution, Mikheil Saakashvili became the President of Georgia in 2004. Ahead of the 2004 parliamentary and presidential elections, he promised to restore the territorial integrity of Georgia. During one of his early speeches, Saakashvili addressed the separatist regions, saying, "[N]either Georgia nor its president will put up with disintegration of Georgia. Therefore, we offer immediate negotiations to our Abkhazian and Ossetian friends. We are ready to discuss every model of statehood by taking into consideration their interests for the promotion of their future development." Since 2004, tensions began to rise as the Georgian authorities strengthened their efforts to bring the region back under their rule. Georgia sent police to close down a black market, which was one of the region's chief sources of revenue, selling foodstuffs and fuel smuggled from Russia. This was followed by fighting by Georgian troops and peacekeepers against South Ossetian militiamen and freelance fighters from Russia. Hostage takings, shootouts and occasional bombings left dozens dead and wounded. A ceasefire deal was reached on 13 August though it was repeatedly violated. The Georgian government protested against the allegedly increasing Russian economic and political presence in the region and against the uncontrolled military of the South Ossetian side. It also considered the peacekeeping force (consisting in equal parts of South Ossetians, North Ossetians, Russians and Georgians) to be non-neutral and demanded its replacement. [not in citation given] Joseph Biden (Chairman, U.S. Senate Foreign Relations Committee), Richard Lugar, and Mel Martinez sponsored a resolution accusing Russia of attempting to undermine Georgia's territorial integrity and called for replacing the Russian-manned peacekeeping force operating under CIS mandate. According to U.S. senator Richard Lugar, the United States supported Georgia's call for the withdrawal of Russian peacekeepers from the conflict zones. Later, EU South Caucasus envoy Peter Semneby said that "Russia's actions in the Georgia spy row have damaged its credibility as a neutral peacekeeper in the EU's Black Sea neighbourhood." Tensions between Georgia and Russia began escalating in April 2008. A bomb explosion on 1 August 2008 targeted a car transporting Georgian peacekeepers. South Ossetians were responsible for instigating this incident, which marked the opening of hostilities and injured five Georgian servicemen. In response, several South Ossetian militiamen were hit. South Ossetian separatists began shelling Georgian villages on 1 August. These artillery attacks caused Georgian servicemen to return fire periodically since 1 August. At around 19:00 on 7 August 2008, Georgian president Mikheil Saakashvili announced a unilateral ceasefire and called for peace talks. However, escalating assaults against Georgian villages (located in the South Ossetian conflict zone) were soon matched with gunfire from Georgian troops, who then proceeded to move in the direction of the capital of the self-proclaimed Republic of South Ossetia (Tskhinvali) on the night of 8 August, reaching its centre in the morning of 8 August. One Georgian diplomat told Russian newspaper Kommersant on 8 August that by taking control of Tskhinvali, Tbilisi wanted to demonstrate that Georgia wouldn't tolerate killing of Georgian citizens. According to Russian military expert Pavel Felgenhauer, the Ossetian provocation was aimed at triggering the Georgian response, which was needed as a pretext for premeditated Russian military invasion. According to Georgian intelligence, and several Russian media reports, parts of the regular (non-peacekeeping) Russian Army had already moved to South Ossetian territory through the Roki Tunnel before the Georgian military action. Russia accused Georgia of "aggression against South Ossetia", and launched a large-scale land, air and sea invasion of Georgia with the pretext of "peace enforcement" operation on 8 August 2008. Russian airstrikes against targets within Georgia were also launched. Abkhaz forces opened a second front on 9 August by attacking the Kodori Gorge, held by Georgia. Tskhinvali was seized by the Russian military by 10 August. Russian forces occupied the Georgian cities of Zugdidi, Senaki, Poti, and Gori (the last one after the ceasefire agreement was negotiated). Russian Black Sea Fleet blockaded the Georgian coast. A campaign of ethnic cleansing against Georgians in South Ossetia was conducted by South Ossetians, with Georgian villages around Tskhinvali being destroyed after the war had ended. The war displaced 192,000 people, and while many were able to return to their homes after the war, a year later around 30,000 ethnic Georgians remained displaced. In an interview published in Kommersant, South Ossetian leader Eduard Kokoity said he would not allow Georgians to return. President of France Nicolas Sarkozy negotiated a ceasefire agreement on 12 August 2008. On 17 August, Russian president Dmitry Medvedev announced that Russian forces would begin to pull out of Georgia the following day. Russia recognised Abkhazia and South Ossetia as separate republics on 26 August. In response to Russia's recognition, the Georgian government severed diplomatic relations with Russia. Russian forces left the buffer areas bordering Abkhazia and South Ossetia on 8 October and the European Union Monitoring Mission in Georgia assumed authority over the buffer areas. Since the war, Georgia has maintained that Abkhazia and South Ossetia are Russian-occupied Georgian territories. JPKF map indicating Georgian-controlled areas of South Ossetia (hatched shading) in June 2007. South Ossetia is in the very heart of the Caucasus at the juncture of Asia and Europe, and it occupies the southern slopes of the Greater Caucasus Mountain Range and the foothills' part of the Kartalin Valley. South Ossetia is a very mountainous region. The Likhi Range is roughly in the center of South Ossetia, and the plateau that's also roughly in the center of South Ossetia is called Iberia. The Greater Caucasus Mountain Range forms the northern border of South Ossetia with Russia, and the main roads through the mountain range into Russian territory lead through the Roki Tunnel between South and North Ossetia and the Darial Gorge. The Roki Tunnel was vital for the Russian military in the 2008 South Ossetia war because it is the only direct route through the Caucasus Mountains. South Ossetia covers an area of about 3,900 km2 (1,506 sq mi), separated by the mountains from the more populous North Ossetia (which is part of Russia) and extending southwards almost to the Mtkvari river in Georgia. More than 89% of South Ossetia lies over 1,000 m (3,281 ft) above sea level, and its highest point is Mount Khalatsa at 3,938 m (12,920 ft) above sea level. Nearby Mount Kazbek is 5,047 m (16,558 ft), and it is of volcanic origin. The region between Kazbek and Shkhara (a distance of about 200 km (124 mi) along the Main Caucasus Range) is dominated by numerous glaciers. Out of the 2,100 glaciers that exist in the Caucasus today, approximately 30% are located within Georgia which South Ossetia forms a part of. The term Lesser Caucasus Mountains is often used to describe the mountainous (highland) areas of southern Georgia that are connected to the Greater Caucasus Mountain Range by the Likhi Range. The overall region can be characterized as being made up of various, interconnected mountain ranges (largely of volcanic origin) and plateaus that do not exceed 3,400 meters (11,155 ft) in elevation. Most of South Ossetia is in the Kura Basin with the rest of it in the Black Sea basin. The Likhi and Racha ridges act as divide separating these two basins. Major rivers in South Ossetia include the Greater and Little Liakhvi, Ksani, Medzhuda, Tlidon, Canal Saltanis, Ptsa River and host of other tributaries. 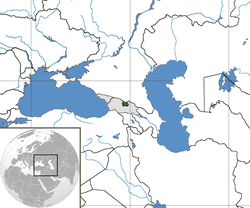 South Ossetia's climate is affected by subtropical influences from the East and Mediterranean influences from the West. The Greater Caucasus range moderates the local climate by serving as a barrier against cold air from the North, which results in the fact that, even at great heights, it is warmer there than in the Northern Caucasus. Climatic zones in South Ossetia are determined by distance from the Black Sea and by altitude. The plains of eastern Georgia are shielded from the influence of the Black Sea by mountains that provide a more continental climate. The foothills and mountainous areas (including the Greater Caucasus Mountains) experience cool, wet summers and snowy winters, with snow cover often exceeding 2 meters in many regions. The penetration of humid air masses from the Black Sea to the West of South Ossetia is often blocked by the Likhi mountain range. The wettest periods of the year in South Ossetia generally occur during spring and autumn while the winter and summer months tend to be the driest. Elevation plays an important role in South Ossetia where climatic conditions above 1,500 metres (4,921 ft) are considerably colder than in any lower-lying areas. The regions that lie above 2,000 metres (6,562 ft) frequently experience frost even during the summer months. The average temperature in South Ossetia in January is around +4 degrees Celsius, and the average temperature in July is around +20.3 degrees Celsius. The average yearly liquid precipitation in South Ossetia is around 598 millimeters. In general, Summer temperatures average 20 °C (68 °F) to 24 °C (75.2 °F) across much of South Ossetia, and winter temperatures average 2 °C (35.6 °F) to 4 °C (39.2 °F). Humidity is relatively low and rainfall across South Ossetia averages 500 to 800 mm (19.7 to 31.5 in) per year. Alpine and highland regions have distinct microclimates though. At higher elevations, precipitation is sometimes twice as heavy as in the eastern plains of Georgia. Alpine conditions begin at about 2,100 m (6,890 ft), and above 3,600 m (11,811 ft) snow and ice are present year-round. South Ossetia's economy is primarily agricultural, although less than 10% of South Ossetia's land area is cultivated. Cereals, fruit and vines are the major produce. Forestry and cattle industries are also maintained. A number of industrial facilities also exist, particularly around the capital, Tskhinvali. Russian Presidential Decree No. 1261 recognising South Ossetian independence. Following the 2008 South Ossetia war, Russia recognized South Ossetia as independent. This unilateral recognition by Russia was met by condemnation from Western Blocs, such as NATO, Organization for Security and Co-operation in Europe and the European Council due to the violation of Georgia's territorial integrity. The EU's diplomatic response to the news was delayed by disagreements between Eastern European states, the UK wanting a harsher response and Germany, France and other states' desire not to isolate Russia. Former US envoy Richard Holbrooke said the conflict could encourage separatist movements in other former Soviet states along Russia's western border. Several days later, Nicaragua became the second country to recognize South Ossetia. Venezuela recognized South Ossetia on September 10, 2009, becoming the third UN member state to do so. The European Union, Council of Europe, North Atlantic Treaty Organization (NATO) and most UN member countries do not recognize South Ossetia as an independent state. The de facto republic governed by the secessionist government held a second independence referendum on 12 November 2006, after its first referendum in 1992 was not recognized by most governments as valid. According to the Tskhinvali election authorities, the referendum turned out a majority for independence from Georgia where 99% of South Ossetian voters supported independence and the turnout for the vote was 95%. The referendum was monitored by a team of 34 international observers from Germany, Austria, Poland, Sweden and other countries at 78 polling stations. However, it was not recognized internationally by the UN, European Union, OSCE, NATO and the Russian Federation, given the lack of ethnic Georgian participation and the illegality of such a referendum without recognition from the Georgian government in Tbilisi. The European Union, OSCE and NATO condemned the referendum. Parallel to the secessionist held referendum and elections, to Eduard Kokoity, the then President of South Ossetia, the Ossetian opposition movement (People of South Ossetia for Peace) organized their own elections contemporaneously in Georgian-controlled areas within South Ossetia, in which Georgian and some Ossetian inhabitants of the region voted in favour of Dmitry Sanakoyev as the alternative President of South Ossetia. The alternative elections of Sanakoyev claimed full support of the ethnic Georgian population. In April 2007, Georgia created the Provisional Administrative Entity of South Ossetia, staffed by ethnic Ossetian members of the separatist movement. Dmitry Sanakoyev was assigned as the leader of the Entity. It was intended that this provisional administration would negotiate with central Georgian authorities regarding its final status and conflict resolution. On 10 May 2007, Sanakoyev was appointed by the President of Georgia as the Head of South Ossetian Provisional Administrative Entity. On July 13, 2007, Georgia set up a state commission, chaired by the Prime Minister Zurab Noghaideli, to develop South Ossetia's autonomous status within the Georgian state. According to the Georgian officials, the status was to be elaborated within the framework of "an all-inclusive dialogue" with all the forces and communities within the Ossetian society. On 30 August 2008, Tarzan Kokoity, the Deputy Speaker of South Ossetia's parliament, announced that the region would soon be absorbed into Russia, so that South and North Ossetians could live together in one united Russian state. Russian and South Ossetian forces began giving residents in Akhalgori, the biggest town in the predominantly ethnic Georgian eastern part of South Ossetia, the choice of accepting Russian citizenship or leaving. However, Eduard Kokoity, the then president of South Ossetia, later stated that South Ossetia would not forgo its independence by joining Russia: "We are not going to say no to our independence, which has been achieved at the expense of many lives; South Ossetia has no plans to join Russia." Civil Georgia has said that this statement contradicts previous ones made by Kokoity earlier that day, when he indicated that South Ossetia would join North Ossetia in the Russian Federation. The South Ossetian and Russian presidents signed an "alliance and integration" treaty on 18 March 2015. The agreement includes provisions to incorporate the South Ossetian military into Russia's armed forces, integrate the customs service of South Ossetia into that of Russia's, and commit Russia to paying state worker salaries in South Ossetia at rates equal to those in the North Caucasus Federal District. The Associated Press described the treaty as calling for "nearly full integration" and compared it to a 2014 agreement between Russia and Abkhazia. The Georgian Foreign Ministry described the signing of the treaty as "actual annexation" of the disputed region by Russia, and the United States and European Union said they would not recognize it. In another move towards integration with the Russian Federation, South Ossetian President Leonid Tibilov proposed in December 2015 a name change to "South Ossetia–Alania" — in analogy with "North Ossetia–Alania", a Russian federal subject. Tibilov furthermore suggested holding a referendum on joining the Russian Federation prior to April 2017, which would lead to a united "Ossetia–Alania". In April 2016, Tibilov said he intended to hold the referendum before August of that year. However, on 30 May, Tibilov postponed the referendum until after the presidential election due in April 2017. At the name-change referendum, nearly 80 percent of those who voted endorsed the name-change, while the presidential race was won by Anatoliy Bibilov — against the incumbent, Tibilov, who had been supported by Moscow and who, unlike Bibilov, was ready to heed Moscow's wish for the integration referendum not be held any time soon. The legislation, however, also lists "special" cases in which entry into the breakaway regions will not be regarded as illegal. It stipulates that a special permit on entry into the breakaway regions can be issued if the trip there "serves Georgia’s state interests; peaceful resolution of the conflict; de-occupation or humanitarian purposes." The law also bans any type of economic activity – entrepreneurial or non- entrepreneurial, if such activities require permits, licenses or registration in accordance with Georgian legislation. It also bans air, sea and railway communications and international transit via the regions, mineral exploration and money transfers. The provision covering economic activities is retroactive, going back to 1990. In November 2009, during the opening ceremony of a new Georgian Embassy building in Kiev, Ukraine, Georgian President Mikheil Saakashvili stated that residents of South Ossetia and Abkhazia could also use its facilities: "I would like to assure you, my dear friends, that this is your home, as well, and here you will always be able to find support and understanding". Until the armed conflict of August 2008, South Ossetia consisted of a checkerboard of Georgian-inhabited and Ossetian-inhabited towns and villages. The largely Ossetian capital city of Tskhinvali and most of the other Ossetian-inhabited communities were governed by the separatist government, while the Georgian-inhabited villages and towns were administered by the Georgian government. This close proximity and the intermixing of the two communities has made the Georgian–Ossetian conflict particularly dangerous, since any attempt to create an ethnically pure territory would involve population transfers on a large scale. The political dispute has yet to be resolved and the South Ossetian separatist authorities govern the region with effective independence from Tbilisi. Although talks have been held periodically between the two sides, little progress was made under the government of Eduard Shevardnadze (1993–2003). His successor Mikheil Saakashvili (elected 2004) made the reassertion of Georgian governmental authority a political priority. Having successfully put an end to the de facto independence of the southwestern province of Ajaria in May 2004, he pledged to seek a similar solution in South Ossetia. After the 2004 clashes, the Georgian government has intensified its efforts to bring the problem to international attention. On 25 January 2005, President Saakashvili presented a Georgian vision for resolving the South Ossetian conflict at the Parliamentary Assembly of the Council of Europe session in Strasbourg. Late in October, the US government and the OSCE expressed their support to the Georgian action plan presented by Prime Minister Zurab Noghaideli at the OSCE Permanent Council at Vienna on 27 October 2005. On 6 December, the OSCE Ministerial Council in Ljubljana adopted a resolution supporting the Georgian peace plan which was subsequently rejected by the South Ossetian de facto authorities. Under Article 46 of the Constitution, the president of the Republic of South Ossetia is head of state and head of the executive branch of government. The president of RSO is elected by direct popular vote for five years. Since 21 April 2017, the position is held by Anatoliy Bibilov who won a contested election running against the incumbent, Leonid Tibilov. The country's legislative body is the unicameral Parliament of South Ossetia that comprises 34 members elected by popular vote for five years. The government of South Ossetia is a component of the integrated system of the executive branch. South Ossetia's armed forces in 2017 were partially incorporated into the Armed Forces of Russia. Ethnic map of the Caucasus from 1995 Ossetians live in North and South Ossetia. Because the statistical office of Georgia was not able to conduct the 2002 Georgian census in South Ossetia, the present composition of the population of South Ossetia is unknown, although according to some estimates there were 47,000 ethnic Ossetians and 17,500 ethnic Georgians in South Ossetia in 2007. 2009 Population Estimate: During the war, according to Georgian officials, 15,000 Georgians moved to Georgia proper; South Ossetian officials indicate that 30,000 Ossetians fled to North Ossetia, and a total of 500 citizens of South Ossetia were killed. This left the estimated population at 54,500. However Russia's reconstruction plan involving 600 million dollars in aid to South Ossetia may have spurred immigration into the de facto independent republic, especially with Russia's movement of 3,700 soldiers into South Ossetia. RIA Novosti places the population of South Ossetia at 80,000, although this figure is probably too optimistic. According to the 2015 census conducted by the South Ossetian authorities, the region's total population was 53,532, including 48,146 Ossetians (89.9%), 3,966 Georgians (7.4%), and 610 Russians. Of these, 30,432 lived in Tskhinvali. The Georgian authorities have questioned the accuracy of these data. Christianity is the major religion practiced by the Ossetians but Islam and the neopagan religion Ætsæg Din ("Right Faith") also have followers. The Dzuarikau–Tskhinvali pipeline, delivering natural gas from Russia to South Ossetia, went online in 2009. President Eduard Kokoity has admitted that his country is seriously dependent on Russian economic assistance. South Ossetia's poverty threshold stood at 3,062 rubles a month in the fourth quarter of 2007, or 23.5 percent below Russia's average, while South Ossetians have incomparably smaller incomes. Before the 2008 South Ossetia war, South Ossetia's industry consisted of 22 small factories, with a total production of 61.6 million rubles in 2006. In 2007, only 7 factories were functioning. In March, 2009, it was reported that most of the production facilities were standing idle and were in need of repairs. Even successful factories have a shortage of workers, are in debt and have a shortage of working capital. One of the largest local enterprises is the Emalprovod factory, which has 130 employees. The South Ossetian authorities are planning to improve finances by boosting the local production of flour and thus reducing the need for flour imports. For this purpose, the area planted with wheat was increased tenfold in 2008 from 130 hectares to 1,500 hectares. The wheat harvest in 2008 was expected to be 2,500 tons of grain. The South Ossetian Agriculture ministry also imported some tractors in 2008, and was expecting delivery of more farm machinery in 2009. Russia planned to spend 10 billion rubles in the restoration of South Ossetia in 2008. The economy is currently very dependent on funding from Russia. In 2017 the Administration of South Ossetia estimated its GDP to be nearly 0.1 billion US dollars. The country's principal university is South Ossetia State University in Tskhinvali. After the Russo-Georgian War in 2008, education officials attempted to place most university-bound students from South Ossetia in Russian post-secondary education institutions. Scenery in central South Ossetia. School Number 2 in Tskhinvali. Members of the South Ossetian armed forces during the Victory Day parade in Tskhinvali in May 2009. ^ "Unrecognized states: South Ossetia" (in Russian). 28 January 2014. Archived from the original on 5 May 2014. Retrieved 5 May 2014. ^ a b "population census 2015". Archived from the original on 13 August 2016. Retrieved 14 August 2016. The first round of voting was accompanied by a referendum in which the Ossetians were to decide whether Russian should become the second official language of South Ossetia. Nearly 85 per cent of the voters supported the referendum. ^ "Ossetia" Archived 23 October 2018 at the Wayback Machine. Collins English Dictionary. ^ "South Ossetia Referendum On Name Change Steers Clear Of Thornier Unification Issue". RadioFreeEurope/RadioLiberty. Archived from the original on 14 September 2017. Retrieved 23 July 2018. ^ "Referendum to rename South Ossetia 'Alania' set for April". oc-media.org. Archived from the original on 24 July 2018. Retrieved 23 July 2018. ^ "Chavez Recognizes South Ossetia, Abkhazia As Independent – Radio Free Europe/Radio Liberty © 2009". Rferl.org. 10 September 2009. Archived from the original on 26 September 2009. Retrieved 22 June 2010. ^ "Nicaragua recognizes South Ossetia and Abkhazia | Top Russian news and analysis online | 'RIA Novosti' newswire". En.rian.ru. Archived from the original on 18 October 2015. Retrieved 22 June 2010. ^ "Venezuela recognizes S. Ossetia, Abkhazia as independent – Chavez". Russian news and analysis online | 'RIA Novosti' newswire. Archived from the original on 26 September 2009. Retrieved 22 June 2010. ^ "Сообщение МИД РЮО | Информационное агентство Рес". Cominf.org. 23 September 2011. Archived from the original on 11 October 2012. Retrieved 18 February 2012. ^ "Occupied Territories of Georgia. Tskhinvali region". Archived from the original on 23 August 2017. Retrieved 23 August 2017. ^ a b c d e f g h "Georgia: Avoiding War in South Ossetia" (PDF). International Crisis Group. 26 November 2004. ICG Europe Report 159. Archived from the original (PDF) on 13 August 2008. Retrieved 13 August 2008. ^ Charles King (2008). "The Five-Day War: Managing Moscow After the Georgia Crisis" (PDF). Foreign Affairs. Georgetown University (November/December). Archived (PDF) from the original on 23 September 2014. Retrieved 22 June 2010. ^ a b "South Ossetia Looking Much Like a Failed State". Associated Press. Archived from the original on 8 July 2010. Retrieved 12 July 2010. ^ "NATO Membership Would Strain Georgia's Ties with Russia – Medvedev". RIA Novosti. 7 August 2013. Archived from the original on 18 October 2015. Retrieved 23 October 2015. ^ Smolar, Piotr (8 October 2013). "Georgia wary of Russian encroachment". The Guardian. Archived from the original on 6 March 2017. Retrieved 16 December 2016. ^ Ossetian Question 1994, p. 38. ^ a b Ossetian Question 1994, p. 39. ^ Ossetian Question 1994, p. 40. ^ Ossetian Question 1994, p. 37. ^ a b Roland Topchishvili (2009). "Georgian-Ossetian ethno-historical review" (PDF). Tbilisi: Tbilisi State University. Archived from the original (PDF) on 24 December 2013. ^ Souleimanov 2013, p. 99. ^ a b c Souleimanov 2013, pp. 112–113. ^ Saparov, Arsène (2014). From Conflict to Autonomy in the Caucasus: The Soviet Union and the Making of Abkhazia, South Ossetia and Nagorno Karabakh. Routledge. ISBN 9781317637844. Archived from the original on 5 January 2016. Retrieved 19 November 2015. ^ a b Ossetian Question 1994, pp. 153–161. ^ a b "Russian Federation: Legal Aspects of War in Georgia". Library of Congress. Archived from the original on 16 July 2014. ^ a b Ossetian Question 1994, pp. 72–73. ^ Ossetian Question 1994, p. 42. ^ "Ethnic tensions: War in the Caucasus is Stalin's legacy Archived 20 June 2018 at the Wayback Machine". The Independent. 17 August 2008. ^ Souleimanov 2013, p. 119. ^ a b c d Stuart J. Kaufman (2001). Modern Hatreds: The Symbolic Politics of Ethnic War. Cornell University Press. p. 110. ISBN 0801487366. ^ Zverev, Alexei (1996). Ethnic Conflicts in the Caucasus 1988–1994. Archived from the original on 27 November 2012. Retrieved 19 November 2015. ^ "The Georgian – South Ossetian Conflict, chapter 8 & appendix". Caucasus.dk. Archived from the original on 10 March 2011. Retrieved 22 June 2010. ^ a b "The Georgian – South Ossetian Conflict, chapter 4". Caucasus.dk. Archived from the original on 10 March 2011. Retrieved 22 June 2010. ^ Human Rights Watch/Helsinki, RUSSIA. THE INGUSH-OSSETIAN CONFLICT IN THE PRIGORODNYI REGION Archived 13 May 2007 at the Wayback Machine, May 1996. ^ "Saakashvili promises Georgians NATO membership in 2014 | Democracy & Freedom Watch". 26 June 2012. Archived from the original on 18 October 2015. Retrieved 22 February 2013. ^ "The Administration of the President of Georgia". President.gov.ge. 26 May 2004. Archived from the original on 11 December 2012. Retrieved 22 February 2013. ^ "Tbilisi Blues". Foreign Affairs. 25 August 2004. Archived from the original on 18 October 2015. Retrieved 22 June 2010. ^ Resolution on Peacekeepers Leaves Room for More Diplomacy Archived 8 October 2007 at the Wayback Machine. Civil Georgia. 2006-02-16. ^ John Pike (13 May 2010). "Reported in Novosti, 5 June 2008". Globalsecurity.org. Archived from the original on 17 August 2008. Retrieved 22 June 2010. ^ U.S. Senator Urges Russian Peacekeepers’ Withdrawal From Georgian Breakaway Republics. (MosNews). ^ Russia 'not neutral' in Black Sea conflict, EU says Archived 10 July 2015 at the Wayback Machine, EUobserver, 10 October 2006. ^ a b Brian Whitmore (12 September 2008). "Is The Clock Ticking For Saakashvili?'". RFE/RL. Archived from the original on 3 September 2014. Retrieved 10 September 2014. ^ "Russia criticised over Abkhazia". BBC News. 24 April 2008. Archived from the original on 15 August 2008. Retrieved 25 May 2017. ^ "Russia says UN Abkhazian refugee resolution counterproductive". RIA Novosti. 16 May 2008. Archived from the original on 9 October 2014. Retrieved 25 May 2017. ^ "Countdown in the Caucasus: Seven days that brought Russia and Georgia to war". Financial Times. 26 August 2008. Archived from the original on 20 September 2008. ^ a b Marc Champion; Andrew Osborn (16 August 2008). "Smoldering Feud, Then War". The Wall Street Journal. ^ Luke Harding (19 November 2008). "Georgia calls on EU for independent inquiry into war". The Guardian. Archived from the original on 13 September 2017. Retrieved 14 December 2017. ^ a b c Roy Allison (2008). "Russia resurgent? Moscow's campaign to 'coerce Georgia to peace'" (PDF). International Affairs. 84 (6): 1145–1171. doi:10.1111/j.1468-2346.2008.00762.x. Archived (PDF) from the original on 23 April 2016. Retrieved 23 October 2015. ^ Jean-Rodrigue Paré (13 February 2009). "The Conflict Between Russia and Georgia". Parliament of Canada. Archived from the original on 2 January 2016. Retrieved 19 November 2015. ^ "Saakashvili Appeals for Peace in Televised Address". Civil.Ge. 7 August 2008. Archived from the original on 19 October 2014. Retrieved 10 September 2014. ^ "The Goals Behind Moscow's Proxy Offensive in South Ossetia". The Jamestown Foundation. 8 August 2008. Archived from the original on 26 October 2014. Retrieved 25 May 2017. ^ "Georgian conflict puts U.S. in middle". Chicago Tribune. 9 August 2008. Archived from the original on 16 October 2014. Retrieved 25 May 2017. ^ Peter Finn (17 August 2008). "A Two-Sided Descent into Full-Scale War". The Washington Post. Archived from the original on 6 November 2012. Retrieved 14 September 2017. ^ Pavel Felgenhauer (14 August 2008). "THE RUSSIAN-GEORGIAN WAR WAS PREPLANNED IN MOSCOW". Archived from the original on 20 August 2014. Retrieved 25 May 2017. ^ Chivers, C.J. (15 September 2008). "Georgia Offers Fresh Evidence on War's Start". The New York Times. Archived from the original on 16 June 2017. Retrieved 14 September 2017. ^ a b Harding, Luke (11 August 2008). "'I got my children out minutes before the bombs fell'". The Guardian. Archived from the original on 5 March 2017. Retrieved 25 May 2017. ^ "Abkhaz separatists strike disputed Georgia gorge". Reuters. 9 August 2008. Archived from the original on 24 September 2015. Retrieved 2 July 2017. ^ "Russia opens new front, drives deeper into Georgia". Associated Press. 11 August 2008. Archived from the original on 14 August 2008. ^ Schwirtz, Michael; Barnard, Anne; Kramer, Andrew E. (11 August 2008). "Russian Forces Capture Military Base in Georgia". The New York Times. Archived from the original on 22 June 2017. Retrieved 14 September 2017. ^ Kramer, Andrew E.; Barry, Ellen (12 August 2008). "Russia, in Accord With Georgians, Sets Withdrawal". The New York Times. Archived from the original on 9 November 2012. Retrieved 14 September 2017. ^ Steven Lee Myers (13 August 2008). "Bush, Sending Aid, Demands That Moscow Withdraw". The New York Times. Archived from the original on 29 October 2017. Retrieved 14 September 2017. ^ "Report. Volume I" (PDF). Independent International Fact-Finding Mission on the Conflict in Georgia. September 2009. p. 27. Archived from the original (PDF) on 7 October 2009. ^ "Amnesty International Satellite Images Reveal Damage to South Ossetian Villages After..." Reuters. 9 October 2008. Archived from the original on 22 February 2014. ^ "Civilians in the line of fire" (PDF). Amnesty International. November 2008. Archived (PDF) from the original on 22 February 2014. Retrieved 18 February 2014. ^ "Georgia Marks Anniversary of War". BBC News. 7 August 2009. Archived from the original on 8 August 2014. Retrieved 9 August 2009. ^ "Rights Groups Say South Ossetian Militias Burning Georgian Villages". RFE/RL. 30 September 2008. Archived from the original on 3 September 2014. Retrieved 28 February 2014. ^ Kunkle, Fredrick (18 August 2008). "Bush, European Leaders Urge Quick Withdrawal From Georgia". Washington Post. Archived from the original on 30 June 2017. Retrieved 14 September 2017. ^ "Statement by President of Russia Dmitry Medvedev". The Kremlin. 26 August 2008. Archived from the original on 2 September 2008. ^ "Georgia breaks ties with Russia". BBC News. 29 August 2008. Archived from the original on 6 October 2014. Retrieved 10 September 2014. ^ "Russia hands over control of Georgian buffer zones to EU". RIA Novosti. 9 October 2008. Archived from the original on 12 October 2008. ^ "Resolution of the Parliament of Georgia on the Occupation of the Georgian Territories by the Russian Federation". 29 August 2008. Archived from the original on 3 September 2008. ^ "Abkhazia, S.Ossetia Formally Declared Occupied Territory". Civil.Ge. 28 August 2008. Archived from the original on 23 July 2009. Retrieved 30 August 2008. ^ a b c "About the Republic of South Ossetia". Archived from the original on 5 November 2013. Retrieved 31 December 2012. ^ "Georgia:Geography". Cac-biodiversity.org. 2003. Archived from the original on 11 May 2011. Retrieved 3 July 2011. ^ "South Ossetia". Hartford-hwp.com. Archived from the original on 19 January 2012. Retrieved 18 February 2012. ^ a b c "South Ossetia Maps: Climate". ALTIUS.com. Archived from the original on 5 November 2013. Retrieved 31 December 2012. ^ a b The Earthtimes. "Nicaragua joins Russia in recognizing South Ossetia, Abkhazia, 3 September 2008". Earthtimes.org. Archived from the original on 7 July 2012. Retrieved 22 June 2010. ^ "West condemns Russia over Georgia, BBC, 26 August 2008". BBC News. 26 August 2008. Archived from the original on 20 April 2010. Retrieved 22 June 2010. ^ "OSCE Chair Condemns Russia's Recognition of Abkhazia, S.Ossetia, Civil Georgia, 26 August 2008". Civil.ge. 1 July 2001. Archived from the original on 7 June 2011. Retrieved 22 June 2010. ^ Reuters, "UPDATE 1-EU faces tough test of unity on Russia". Archived from the original on 3 June 2010. Retrieved 1 October 2013. , Forbes, 31 August 2008. ^ AP, Russia support for separatists could have ripples, New York Times, 31 August 2008. ^ "Venezuela recognises Georgia rebel regions – reports". Reuters. 10 September 2009. Archived from the original on 9 August 2017. Retrieved 10 September 2009. ^ Niko Mchedlishvili (11 September 2006). "Georgian rebel region to vote on independence". Reuters. Archived from the original on 5 January 2016. Retrieved 23 October 2015. ^ "Online Magazine – Civil Georgia". Civil.ge. 1 July 2001. Archived from the original on 13 August 2008. Retrieved 22 June 2010. ^ "99% of South Ossetian voters approve independence". Regnum. 13 November 2006. Archived from the original on 30 September 2007. ^ "S. Ossetia: 99% back independence". CNN.com. Associated Press. 13 November 2006. Archived from the original on 28 November 2006. ^ "Two Referendums and Two "Presidents" in South Ossetia". Caucaz.Com. 20 November 2006. Archived from the original on 28 November 2006. Retrieved 22 June 2010. ^ "Online Magazine – Civil Georgia". Civil.ge. 1 July 2001. Archived from the original on 8 October 2007. Retrieved 22 June 2010. ^ Anonymous – Caucasus. "Georgia's Showcase in South Ossetia". Iwpr.net. Archived from the original on 5 January 2016. Retrieved 22 June 2010. ^ "Georgia Quits Mixed Control Commission – Kommersant Moscow". Commersant.com. Archived from the original on 22 July 2011. Retrieved 22 June 2010. ^ Commission to Work on S.Ossetia Status Archived 8 October 2007 at the Wayback Machine. Civil Georgia 13 July 2007. ^ a b Halpin, Tony (30 August 2008). "Kremlin announces that South Ossetia will join 'one united Russian state'". The Times. London: News Corp. Archived from the original on 3 September 2008. Retrieved 30 August 2008. ^ Damien McElroy. South Ossetian police tell Georgians to take a Russian passport, or leave their homes Archived 6 April 2018 at the Wayback Machine. The Daily Telegraph, 31 August 2008. ^ a b "Putin signs treaty integrating South Ossetia into Russia". AP / Yahoo. 18 March 2015. Archived from the original on 5 January 2016. Retrieved 29 December 2015. ^ "Russian treaty with rebel Georgian region alarms West". SWI. 18 March 2015. Archived from the original on 2 April 2015. Retrieved 18 March 2015. ^ "Breakaway Tskhinvali proposes name change". Agenda.ge. 29 December 2015. Archived from the original on 5 January 2016. Retrieved 29 December 2015. ^ "South Ossetia profile – BBC News". Bbc.com. 21 April 2016. Archived from the original on 29 July 2018. Retrieved 12 June 2016. ^ "President: South Ossetia plans to hold referendum on becoming part of Russia before August". TASS. Archived from the original on 14 April 2016. Retrieved 24 April 2016. ^ Fuller, Liz (30 May 2016). "South Ossetia Postpones Referendum On Accession To Russian Federation". RadioFreeEurope/RadioLiberty. Archived from the original on 31 May 2016. Retrieved 30 May 2016. ^ "South Ossetia's Bibilov Wins Election, Puts Moscow In A Bind". RadioFreeEurope/RadioLiberty. Archived from the original on 12 April 2017. Retrieved 12 April 2017. ^ "THE LAW OF GEORGIA ON OCCUPIED TERRITORIES" (PDF). 23 October 2008. Archived from the original (PDF) on 24 June 2014. ^ "Law on occupied territories of Georgia (en.)". Venice.coe.int. Archived from the original on 13 February 2012. Retrieved 18 February 2012. ^ Yuschenko, Saakashvili open new building of Georgian Embassy in Kyiv Archived 18 October 2015 at the Wayback Machine, Interfax-Ukraine (November 19, 2008). ^ Подписано соглашение о вхождении части подразделений армии Южной Осетии в ВС РФ Archived 11 October 2017 at the Wayback Machine TASS, 31 March 2017. ^ G. Tsuladze, N. Maglaperidze, A. Vadachkoria, Eds.,Demographic Yearbook of Georgia: 2001, Georgian Academy of Sciences: Institute of Demographic and Sociological Research (Tbilisi, 2002). This source reports that in January 2002 there were 37,000 Ossetians living in Georgia but excluding South Ossetia. ^ "Georgia: a toponymic note concerning South Ossetia" (PDF). The Permanent Committee on Geographical Names. January 2007. Archived from the original (PDF) on 14 June 2007. ^ "Georgia: UN continues to press for humanitarian access to victims". Un.org. 15 August 2008. Archived from the original on 7 December 2008. Retrieved 22 June 2010. ^ Mikhail Barabanov (2008). "The August War between Russia and Georgia". Mdb.cast.ru. Archived from the original on 15 September 2008. Retrieved 22 June 2010. ^ a b "Russia to provide $200 mln in urgent aid for S. Ossetia". En.rian.ru. 11 August 2008. Archived from the original on 13 November 2014. Retrieved 22 June 2010. ^ Svanidze, Tamar (12 August 2016). "South Ossetian Authorities Release Results of 1st Census in 26 Years". Georgia Today. Archived from the original on 31 December 2017. Retrieved 31 December 2017. ^ "South Ossetia profile". BBC. Archived from the original on 19 February 2014. Retrieved 18 February 2014. ^ "South Ossetia - Ethnic composition: 2015 census". Archived from the original on 6 July 2018. Retrieved 16 July 2018. ^ "Ministry of Foreign Affairs of the Russian Federation". Republic of South Ossetia. 22 May 2014. Archived from the original on 18 October 2015. Retrieved 28 July 2014. ^ a b c d e Delyagin, Mikhail (March 2009). "A Testing Ground for Modernization and a Showcase of Success". Russia in Global Affairs. Archived from the original on 18 October 2015. Retrieved 23 October 2015. ^ Vartanyan, Olesya; Barry, Ellen (18 March 2014). "If History Is a Guide, Crimeans' Celebration May Be Short-Lived". nytimes.com. The New York Times. Archived from the original on 6 October 2014. Retrieved 5 October 2014. ^ a b Holdsworth, Nick (2008). "Students seek refuge in Russian HE". University World News. Higher Education Web Publishing (42). ISSN 1756-297X. Archived from the original on 13 February 2012. Retrieved 20 April 2012. ОСЕТИНСКИЙ ВОПРОС [Ossetian Question] (in Russian). Tbilisi. 1994. Archived from the original on 21 June 2014. Souleimanov, Emil (2013). Understanding Ethnopolitical Conflict: Karabakh, South Ossetia, and Abkhazia Wars Reconsidered. Palgrave Macmillan. ISBN 9781137280237. Border South Ossetia for use in Google Earth. This page was last edited on 19 April 2019, at 21:55 (UTC).